The Chevrolet Equinox is an attractive crossover for a few reasons – it combines some of the most sophisticated safety features on the market with a choice between several powerful engines. On the inside, the car features a choice between 7.0-inch touchscreen navigation or a larger 8.0-inch touchscreen infotainment display. By offering the power and feel of a large SUV with the footprint of a small crossover, Chevrolet has outperformed its previous Equinox models. The standard 170-horsepower engine variant offers all-wheel drive capability. EPA fuel economy ratings place it at 24 miles per gallon on city streets and 30 miles per gallon on the highway. This car features 17-inch aluminum wheels equipped with all-season blackwall tires. Additionally, a compact spare blackwall tire is included with all models. The car features halogen-composite headlamps that brightly illuminate the road ahead. This model’s heated, power-adjustable mirrors can be folded back against the car’s body manually. It also features a rear manual liftgate and door handles matched to the car’s body color. The driver’s and front passenger’s seats both support 4-way manual adjustment. They also feature 2-way adjustable head restraints and a useful auxiliary 12-volt power outlet. A tilting and telescoping steering column makes the car’s 3-spoke deluxe steering wheel accessible to drivers of any size and stature. The Equinox’s semi-automatic single-zone air conditioning system is both powerful and easy to use. A stronger body structure for 2018. High strength steel in key areas protects the passenger compartment. Also new is Surround Vision; it allows drivers to see around the perimeter of the vehicle. This is a great advantage when parking or trailering. The car’s interior safety features are among the best in its class. It offers dual-stage, frontal, driver, and right front passenger airbags with a specialized passenger sensing system – airbags only deploy on impact if a passenger is present. Visit this page and discover the complete list of new 2018 safety features that make Equinox a compelling choice in the crossover category. 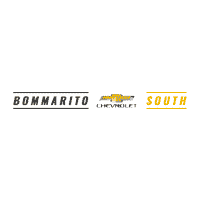 Visit your local Bommarito Chevy dealer to test drive a Chevrolet Equinox today!